The Widened Lines were built between Kings Cross and Moorgate as relief for the Metropolitan Line's tracks. They opened in their entirety in 1868. Only the section between Kings Cross and Farringdon remains in use. 1930s map. Aldersgate Street station has since been renamed Barbican. 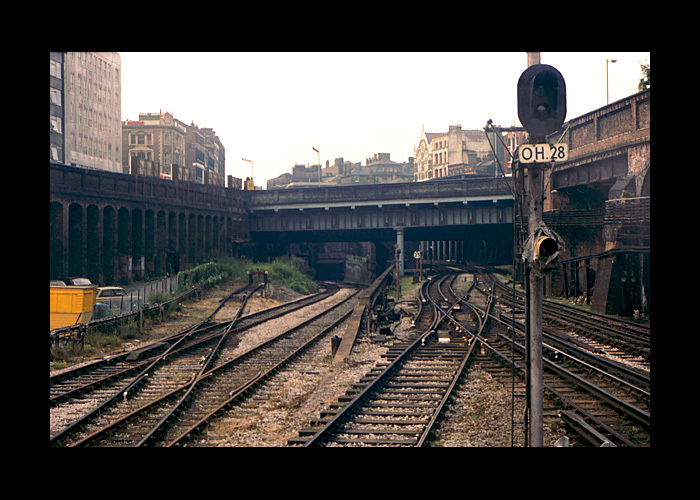 The track north of Farringdon station as it was in the late-1970s or so but certainly after the withdrawal of passenger services on the Widened Lines, judging by the rust on the rails. The Widened Lines are on the left and the Metropolitan Line tracks are on the right (now the Hammersmith & City line). 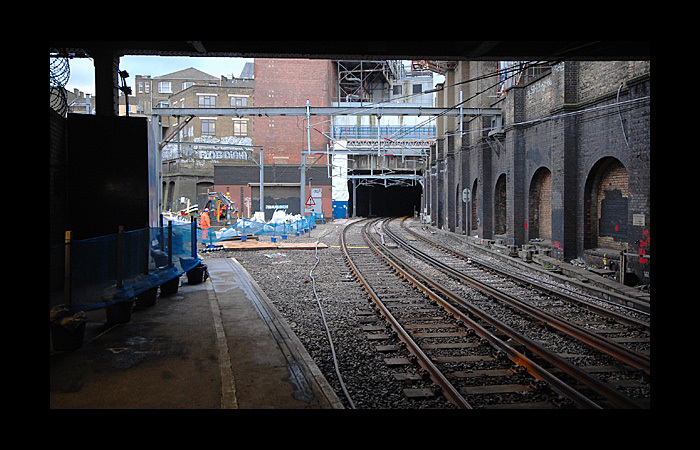 The two sets of lines crossover on the approach to Farringdon station - the Widened Lines pass underneath the Metropolitan Line tracks. To reach the level of Farrindon station, there is quite a steep incline, as seen here (this incline caused problems later when the platform needed to be extended). Move your cursor over the above image to see an elevated view as it was in Sep 2009. The signal, so prominent in the earlier photo, gives positional reference in the later photo. Farringdon station as it was in the mid-1970s or so. The view is northward: the Widened Lines are on the left and the Metropolitan Line tracks are on the right (now the Hammersmith & City line). Farringdon station around 1980/1981 showing preparation for the line to be taken over by Thameslink. The Widened Lines at Farringdon station at the southern end of the station with a northbound train arriving prior to the line being electrified for Thameslink services. The tunnel on the right of the photo leads to Snow Hill - see below for details. 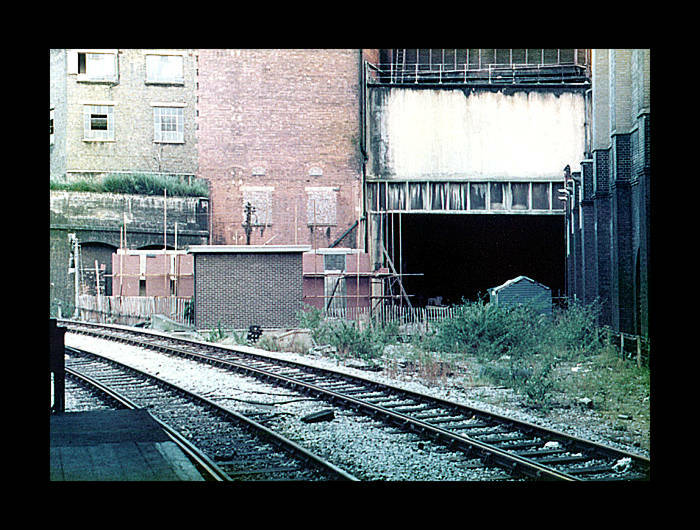 The top level photo shows the southern end of Farringdon station in 1980 or so. The track veering round to the left is en route to Barbican and Moorgate. The tunnel on the right, is the one that leads down to Snow Hill/ Ludgate Circus/ Blackfriars. It was reopened to passenger service in 1988, as part of the Thameslink services. The reverse situation now exists i.e. the Thameslink line remains in use but the Widened Lines connection to Moorgate is closed. To cope with increased passenger traffic, the platforms at Farringdon needed to be lengthened to accommodate 12-car trains. The platforms could not be extended sufficiently at the northern end due to the steep slope of the track, so they had to be extended at the southern end, seen here. The extension cut across the area used by the Moorgate tracks, so the line to Moorgate was closed. Move your cursor over the above image to view it as it was in Jan 2007. Wider angled view of the above in 2010. The tracks to Moorgate have been removed, although the curve of the platform accommodating the track has not been altered. The new platform extension to allow 12 car trains would be built in the space vacated by the track removal. There is little space for the northbound platform extension, as seen on the right of the photo - the entire building was demolished to make way for the extra platform space needed. For a dramatic transformation, move your cursor over the image to see the newly opened platform extension in Mar 2012. The new extension is in fact now treated as the main part of the Thameslink platforms - shorter trains stop at this end and not at the northern end with its narrower platforms. View from Cowcross Street of the Widened Lines to Moorgate, south of Farringdon station. The train visible is parked in the sidings for the Metropolitan line. View of the Widened Lines heading toward the Moorgate direction from Farringdon. Reverse view showing the approach to Farringdon station. The tunnels that lead to Barbican station. The Snow Hill tunnel leading down to Blackfriars from Farringdon, also had an eastern connection to Moorgate, as seen on the map at the top of this page. The quality of this photo is poor but it does show the tunnel branching off from the main one, as viewed from a passing train. All photos taken 1977 - 1981 unless stated otherwise.